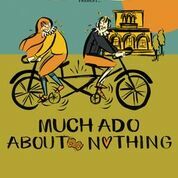 Join their all-male troupe in The Seagull Theatre for a bicycle-powered production of Shakespeare’s ‘Much Ado About Nothing’ like none other. In usual HandleBards style, expect riotous amounts of energy, a fair old whack of chaos, and a great deal of laughter. And what’s the play about? Well – a group of soldiers return from the war to a household in Messina, causing the kindling of new love interests and the re-kindling of old rivalries. The parallel love stories of Beatrice, Benedick, Claudio and Hero become entangled with plotting, frivolity and melodrama in Shakespeare’s famous comedy. Visit www.handlebards.com to find out more!